The number of Native Americans experiencing homelessness fell by half in this year’s point-in-time count. Several Native-led groups believe that is an undercount. On the surface, the results of the 2018 snapshot count of homelessness looked promising in one aspect: the number of homeless Native Americans and Alaska Natives in King County was cut in half compared to last year. But several area, Native-led organizations are aggressively challenging these numbers, released this week in the Count Us In report, which shows that Native Americans portion of the county’s homeless population fell from 6 to 3 percent. Native-led organizations believe this is a dramatic undercount, based on what officials acknowledge could be imperfections in the count methodology. 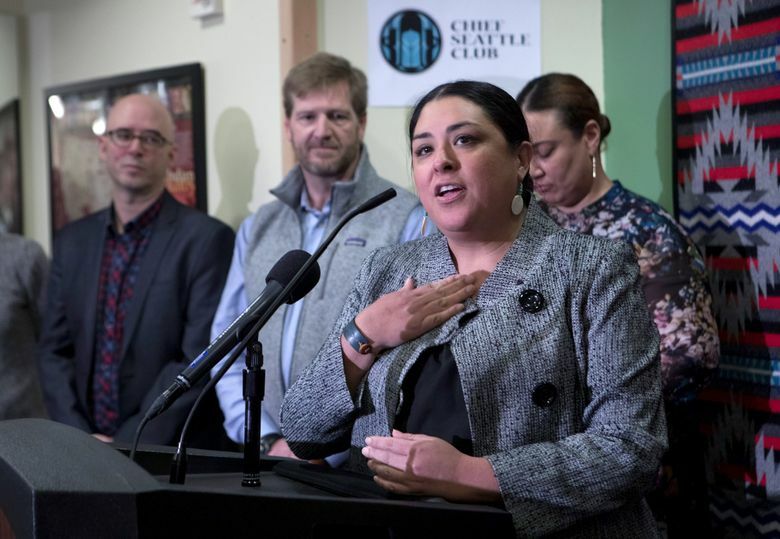 “We absolutely, 100 percent do not believe that the 3 percent (figure) … is accurate,” said Colleen Echohawk, executive director of the Chief Seattle Club, the city’s largest Native-led homeless services provider. The Seattle Indian Health Board and Urban Indian Health Institute shared her concerns. The point-in-time numbers, said Echohawk, might incorrectly indicate Native American homelessness is no longer an issue. They also could impact funding Native-led homeless service organizations receive over the coming year. So far, Chief Seattle Club’s numbers indicate a growing problem: The number of people coming into the club for homeless-related services was up 14 percent between January and May of this year compared to the same time period in 2017, said Derrick Belgarde, the agency’s deputy director. Kira Zylstra, interim director of All Home, King County’s homeless services coordinating agency, said Thursday the report represents a one-night picture of homelessness and should not be seen as representing the entire scope of the issue. People of color made up more than 50 percent of the county’s homeless population during this year’s one-night count, but they made up roughly a third of King County’s overall population in 2016. The difference in the 2017 and 2018 Native American numbers also fall within the count’s 2.9 percent margin of error, said Peter Connery, vice president of Applied Survey Research, the California-based social sciences firm that has done King County’s homeless count for the last two years. The dramatic change could also be a sampling error, which is more likely when dealing with a smaller population, Connery said. Native Americans and Alaskan Natives experienced homelessness at a higher rate than any other ethnic group in King County last year, prompting the city of Seattle to fund more Native-led, homeless service organizations in 2018. Homeless counts are tricky, imperfect science, made up of a one-night census of people living outside and in shelters, and a follow-up survey of a random sampling of homeless people. This year, no surveys were done at the Chief Seattle Club or any other Native-focused organizations, with the exception of one transitional home, Zylstra said. “That is something we would definitely do differently in the future,” she said. Chief Seattle Club also did not recruit any paid guides to do the one-night census, although the club was represented on a steering committee helping to coordinate the count. Abigail Echo-Hawk, Colleen’s sister and director of the Urban Indian Health Institute, said her organization previously raised concerns with All Home about the 2017 count, about how information was collected and how it was analyzed. For example, she said, Native Americans are often grouped into multiracial categories in the U.S. Census and so not counted as Native, reducing their numbers. Vianna Davila: 206-652-6550 or vdavila@seattletimes.com; on Twitter @ViannaDavila.